The notion of balancing capability as a very important factor in overall small boat stability is sometimes misunderstood by people who are used to think about stability in big boats, namely as a static number derived from the hull’s dimensions. All of us have ridden a bicycle at some point in our life, and none of us would qualify a bicycle as a stable vehicle. And yet, people seldom fall of their bicycles, although this vehicle’s own stability is null. This is not due a miracle, but to the fact that bicycles offer humans excellent means to stabilize themselves – easily, intuitively, and most effectively. The same is true for motorcycles and personal watercraft (PWC), which can be driven at high speeds and in difficult conditions. Usually, Jonboats are made of aluminum. They are generally heavier and stiffer than the lightweight polyethylene Wavewalk S4 design. 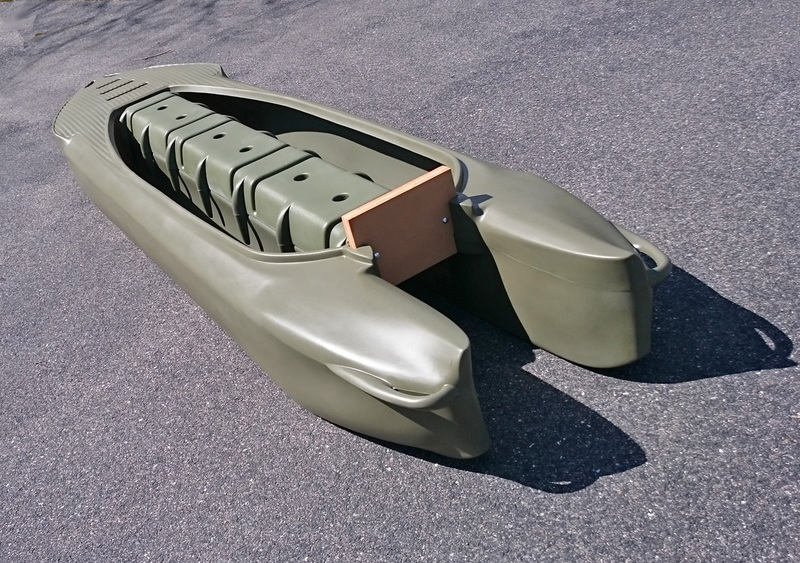 Also, the larger Jonboats can accommodate big motors and are stable enough to wrestle large alligators onto the deck. 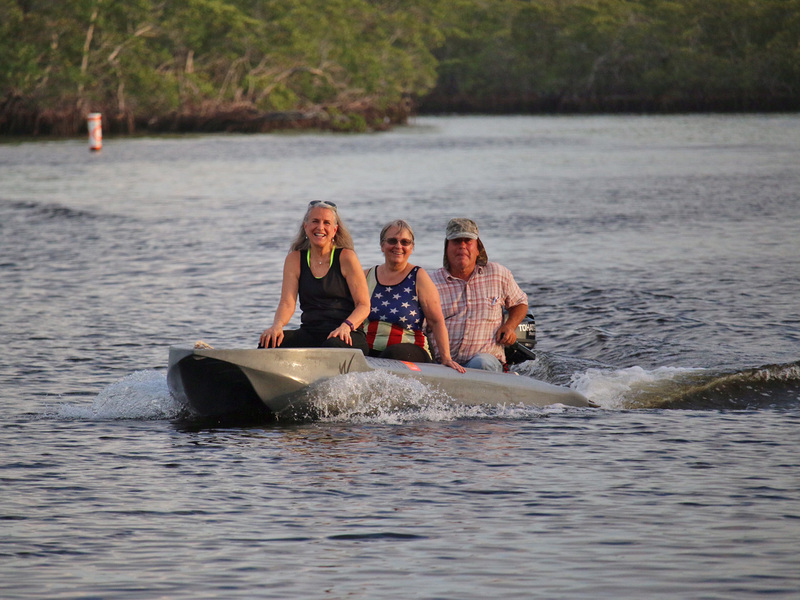 For those of us who are not hunting gators or can not afford ten thousand dollar plus motor packages, the S4 is the perfect motor yak that comes in a stable, attractive, and affordable package. 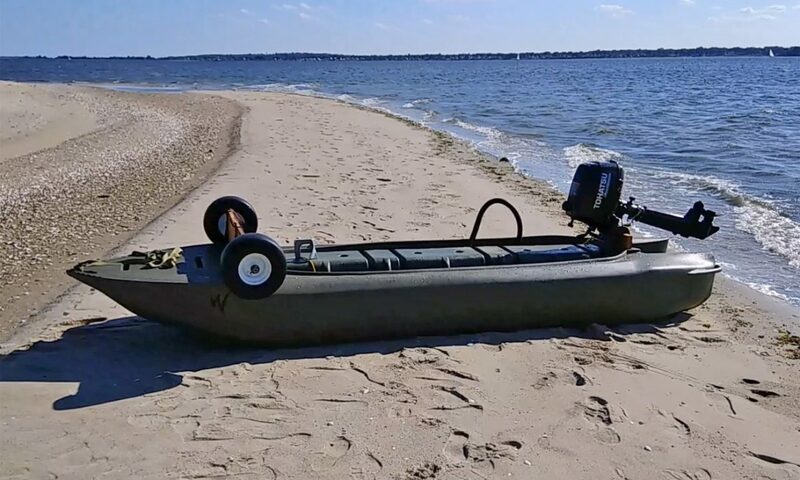 Though I enjoyed using a Sears 12 semi-vee aluminum skiff for many years on near shore fishing trips, I have had far more fun with my new S4. I can easily transition from motorized status to paddling in the numerous non-combustion zones that have been implemented in my marine backyard. And, I can add an electric trolling motor too. The S4 coupled with an affordable motor in the 3.5 to 8 hp range will provide a level of aquatic accessibility unmatched by any Jonboat or skiff that I am familiar with. So, if you are looking to transport a boatload of alligators, get that big aluminum swamp boat. But, for go anywhere fun and affordable fishing or watersports, the S4 is the better choice. Jon boats are a popular and broad class of boats, and a fascinating subject. The main eternal debates seem to be “Jon boat vs. Skiff”, “Flat bottom vs. Semi-V hull”, and “Welded vs. Riveted”. At one time, I considered mounting a mud motor on the W700. However, I am so satisfied with the performance of the lightweight 2 and 4 stroke outboards that this option is off the table, for awhile. The “balancing stability” of the Wavewalk design is like having your own horse on the water without the daily feed, stall, vet, and other maintenance costs. And, the S4 can take up to three people at a gallop. I don’t know what a mud motor is, but when I got to Florida, my first purchase was a 16 foot go-devil boat and motor which could stir up lots of mud and get into places normally restricted to airboats. It was a bear to steer, and after trailering it around for a few months and waiting in long lines at boat ramps, it didn’t take me long to get rid of it in favor of my first 300 Wavewalk, which turned out to be one of the best decisions I’ve made over the last 10 years. 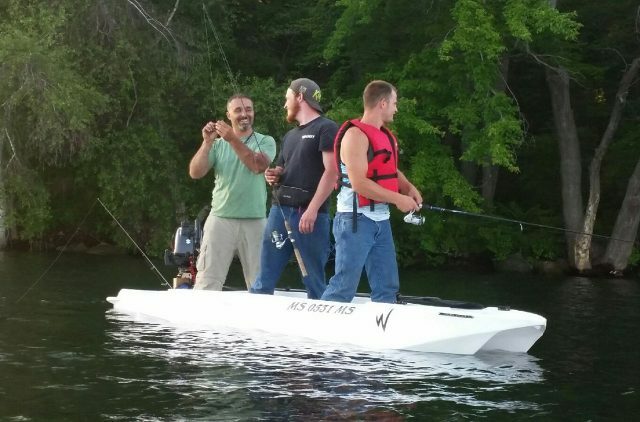 I wonder how many boat / skiff owners would do the same if they were aware of the diverse fishing and recreational boating opportunities available with the three W models. Being a rather impatient fellow, I’d go nuts if I had to wait at boat ramps. A mud motor is a type of outboard gas motor designed especially for going in very shallow (a.k.a. ‘skinny’) water, weed infested water, grass, mud, and over obstacles. Easy steering is not the forte of such motors, but they truly work in those difficult marshy and muddy areas, and I strongly recommend going to YouTube and watching videos of people doing incredible (and incredibly fun) things with these motors. Not that some 20″ long shaft (L) outboard motors offer a tilted position for their propeller shaft, which improves the motor’s performance in very shallow water. Thanks, Yoav……….that sure sounds like my go-devil. During summer scallop season around here, ramp waits can be an hour or more, and if you don’t get there early, there’s no place to park. How great it is to park on the side of the road and just slide the W in. The world must be an awful place for an angler who faces a choice between the torture of waiting at a boat ramp to launch their boat from its trailer (and back to it…), and all sorts of fishing kayaks that are wet, unstable, and would eventually make their users’ back hurt. 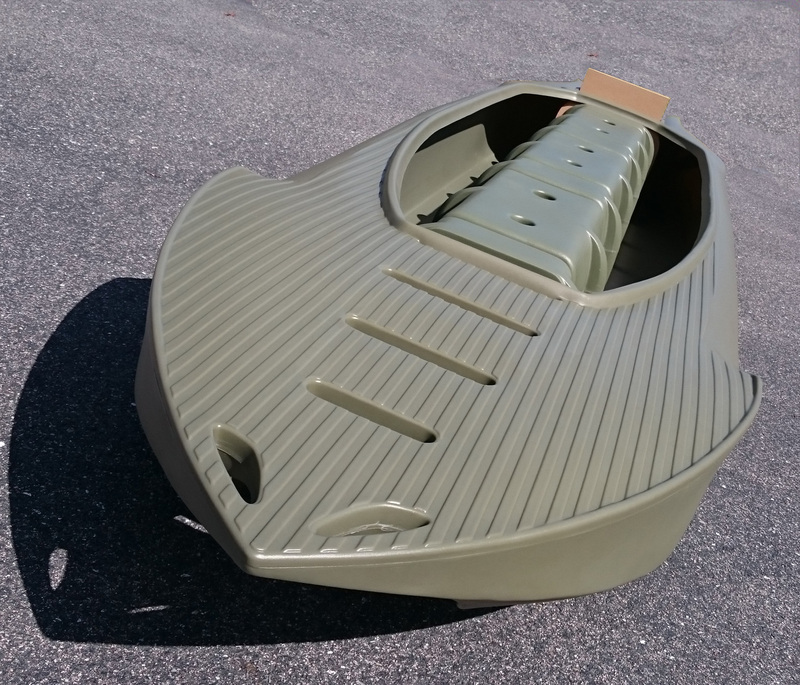 Wavewalk’s three product lines cover the entire range from a lightweight one man kayak to a full fledged, high performance, car-top motorboat. 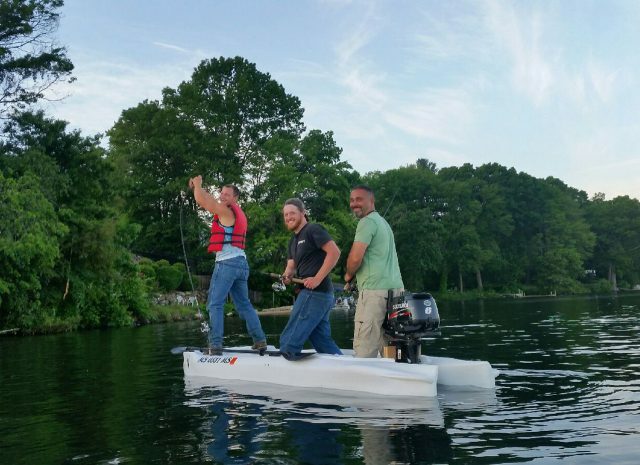 The S4 is the perfect motorized kayak with a 3.5-8 hp motor depending on your own personal lifting capability. And. it paddles very well. 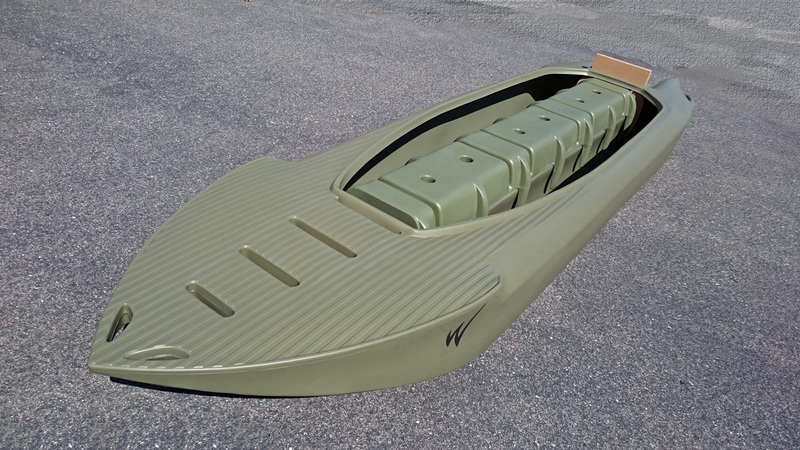 The W700 is the most stable paddling tandem kayak available that can, also, easily be motorized for long distance hauls. And, the W500 is a very stable and comfortable solo kayak that is super easy to convert to electric or low power outboard motor. Each has it’s own niche according to the end user. But, all are better than conventional yaks from a portability, stability, and comfort point of view. Until the mud motors lighten up, those long shaft Tohatsu built small outboards are the right means to bottle up and go. 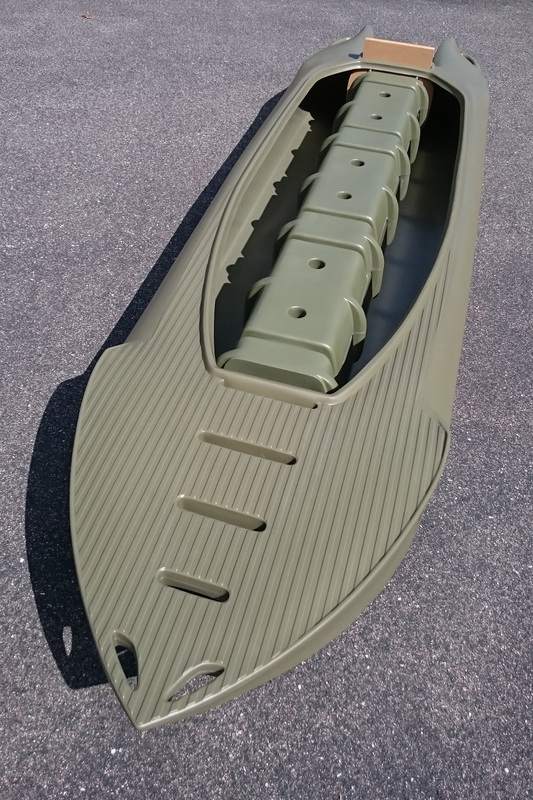 Using definitions such as “kayak” and “motorized kayak” is helpful in some way, as it provides a category of reference to place the Wavewalk model in. But these definitions are pretty limited, and in this sense using them can also limit the way the Wavewalk is perceived and understood. The example that comes to my mind is the fact that in its capacity as a skiff, the S4 works more completely with a crew of the two than it does as a solo skiff. The reason for this is that a second (and preferably heavy) angler sitting at the rear end of the S4 cockpit, next to the motor, makes the stand up casting platform at the bow more level, and therefore more practical as such for the second member of the crew to fish from. This example is refers to things that are outside the range defined by the term “motorized kayak”. I’m pretty sure that as the S4 gets more mileage in the ocean and as a motorboat (“Jon boat”?, “skiff”?, “dinghy”? “runabout”? etc.) it will develop more of a “personality” and an “image” of a motorboat. These things take time, YouTube videos, and reviews. 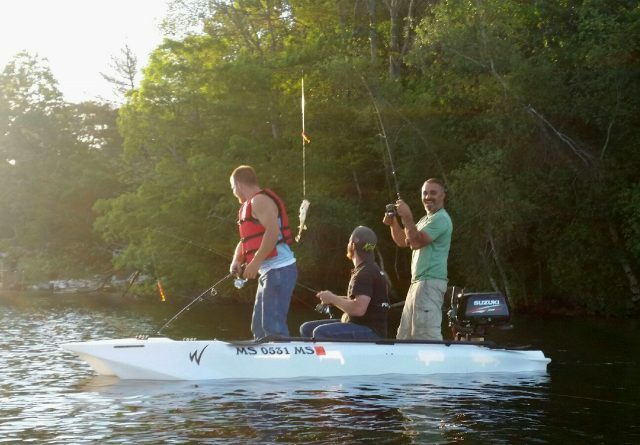 * In reality, “motorized kayak” is a term that describes mainly fishing kayaks outfitted with electric motors. Examples of sit-in and SOT kayaks that are successfully outfitted with outboard gas engines don’t abound, and a detailed scrutiny would reveal that such SIK and SOT setups are typically somewhere between dysfunctional and nonsensical.